Three years ago yesterday (three years!!! ), I was in Jacksonville, FL, with Violin Doctor at a sad and sorry football game. I texted her after yesterday’s game: “Our presence in J-ville three years ago really turned the series around.” Since we were there, the Dawgs have won three straight against that other team. Know what hasn’t changed since that game three years ago? I still don’t have a phd. I know, right? It’s not that I haven’t been doing trying-to-graduate-things since the two year compsiversary, mind you, I just haven’t finished… yet.1 I am MUCH closer to graduating than I was a year ago, but I still have some Things to write, and Lots of Things to re-write and revise. In the past year, I’ve applied for fellowships, traveled to new and not so new-to-me places (New Orleans, Puerto Rico, Charleston, Texas and SXSW, and of course Chicago a few times), found my time with the Writing Intensive Program officially come to an end, and moved out of my office at school. I’ve also written a lot of words and many, many pages. But then, my dad died in August, which puts all of these things in a different perspective. Life is moving on, but I have found myself less willing to freak out about school, less willing to sacrifice sanity for school, and less willing to make school the Most Important Thing.2 I decided to forego attending any national conferences because the thought of them (the stress, travel, and all those academics) seemed completely overwhelming to me.3 While this might not be the best academic decision, I will call it a successful season once our family makes it through the holidays. So unless something unexpected intervenes, I will write a dissertation. I will finish the requirements of my degree, like I said I would. I will graduate in May 2014 (MAY!!!). But for now, even though three years since comps seems like a LONG time (and plenty of time in which to write a dissertation), I think I’m just where I’m supposed to be. 1. Thanks to friend and fellow musicologist T for naming the event! 3. Also, they rejected my abstracts anyway. One year ago yesterday in this post, I speculated that the annual Georgia-Florida football game would likely serve to remind me of comps and a subsequent roadtrip to Jacksonville. And if the past two years are any indication, then I am fulfilling this prophecy. I find it somehow appropriate that during this year’s game (formerly known as The World’s Largest Outdoor Cocktail Party), I was in Nashville interviewing some (formerly of Chicago) folks for my research. I interviewed two different individuals at two different East Nashville coffee shops on Saturday afternoon. For various reasons, I was a little nervous about both of these, but my anxiety was completely unfounded. Both individuals were incredibly nice, and remarkably, both had new and different perspectives about Bloodshot and Chicago music than most of the folks I’ve already spoken with. As I pulled out the lovely city of Nashville, I had the brief and passing thought that I may actually write a dissertation, and that it may actually be interesting (it was brief, and I’m not letting it go to my head, because then I remembered that this nearly three hours of audio adds on to the billions of hours of interviews I still haven’t transcribed). Last year, I was a little disappointed that I hadn’t made a ton of academic/dissertation progress. Well, this year, I completed and defended the prospectus, presented at a bunch of conferences and traveled quite a bit, and am pretty close to wrapping up the interviews and ethnography for the dissertation. And it seems that I have a realistic timeline to write a dissertation and graduate (and no, it’s not exactly soon, cf. billions of hours of interviews). So while transcribing isn’t necessarily happening (it will, it will, it HAS to, sigh), progress is being made. But what might be even more exciting than all of this? Georgia now has a two-game winning streak against Florida, and Kentucky basketball is showing up on my DVR. Go Dawgs and Go Cats! One year ago today, I was incredibly relieved and ridiculously sleep-deprived, riding in a car with Violin Doctor and heading to Jacksonville, Florida, for a football game. At approximately 4:30 a.m. that morning I emailed the last of my comps questions to one of my committee members, concluding the two-week ordeal of written comps for my degree (the oral portion of my comps happened a few weeks later). 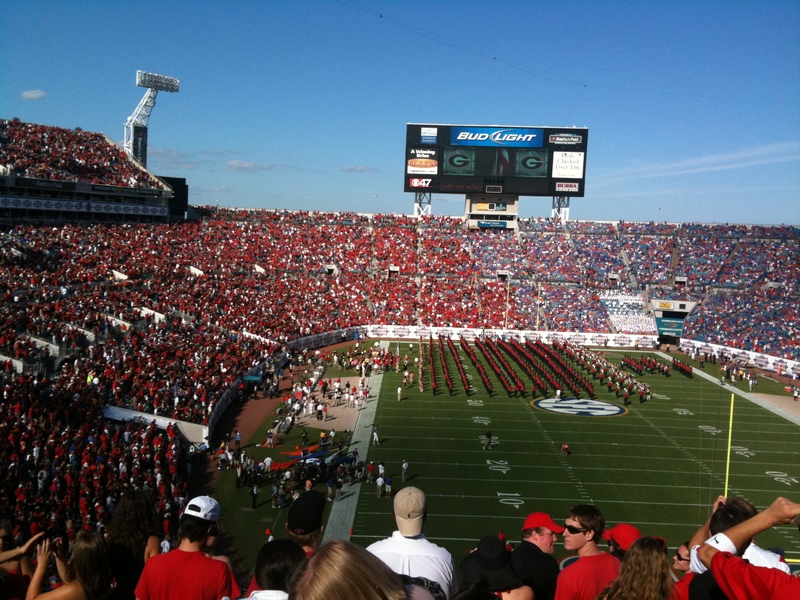 I’m guessing that henceforth, the annual Georgia-Florida game will always remind me of comps and the trip to Jacksonville. Violin Doctor picked me up that morning and after we had been on the road for fifteen or twenty minutes, I realized that I had forgotten my ticket for the game. We promptly turned and went back to my house to get my ticket. We ate an AMAZING meal at Cantina Laredo and had a lovely stay at Hotel Indigo. We met up with one of our professors before the game (my committee member to whom I emailed the comps essay) and he had already read the essay. At one point, I called Professor’s wife’s phone, and they were on the beach flying kites. Of course. The game was, as has been the case recently for Georgia fans, disappointing, and replete with intoxicated folk. The drive back from Jacksonville was not an exciting one… especially after the whole ‘losing the game’ thing. It was a fabulous way to finish up comps. I can’t believe it has already been a year. I also can’t believe I still haven’t submitted the prospectus to the committee. I confess that I didn’t really get very much accomplished the rest of that semester last year. In the Spring semester, I started putting together fabricated bits and pieces of a (faux) prospectus, but about halfway through the semester, Advisor and I realized that I could go to Chicago over the summer and get some data on which to base the (real?) prospectus. And that’s where we are. I’m sending Advisor the first complete-ish draft early next week… so I’ll be at the library all afternoon to (hopefully) shore some of the important missing pieces. And while in one way, it seems like (academically) not a whole lot has happened in this past year, I know I’m making progress (I think? )… just progress at the speed of the tortoise, not the hare. Aesop, let’s hope you’re right on this one.